Dated faucets and spouts can bring a bathroom design down. Remove and replace your old hardware with a new look for an instant bathroom refresh. 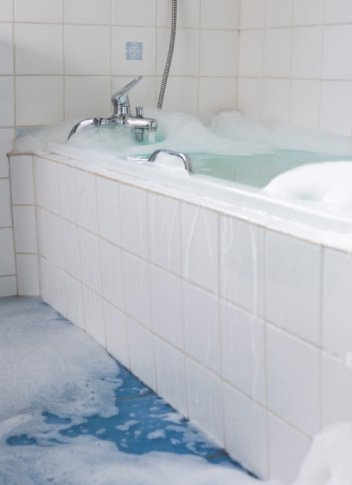 Bathtub spouts often need replacing due to leaks, age and natural corrosion. The spout can be removed with a few tools and simple elbow grease. What Type of Tub Spout? There are two types of ways a spout can be installed: A slip-on spout slides over the tub's 1/2-inch copper pipe and fastened with a setscrew on the bottom, while a screw-on spout is screwed on. A little confusing, but you'll be able to tell the difference. Take a peek underneath your existing tub spout. There may be a small screw at the back of your spout. This is a slip-on spout, and you will first need to remove the screw with a Philips head or flat-head screwdriver or a hex wrench. If you do not see any screws connecting your spout, it's a screw-on. For a screw-on spout, you should be able to twist the spout off by hand. Depending on the age of the spout, you may need a sturdy pair of pliers or a pipe wrench to grasp the entire spout. Screw-on spouts can be removed by turning counterclockwise. Unfortunately, some are tighter than others due to caulk or internal threaded fitting. Gently scrap excess caulk from around the base of spout before twisting. If the spout has copper threaded fitting connecting it, you'll need to snip those off with a wire tubing cutter before removing it. Twist the spout off the copper pipe. Use caution so you don't loosen any pipe connections inside the wall. For a slip-on spout, remove the screw that is holding the spout and place it aside. Be careful that it does not fall down the drain and clog the pipe. Firmly hold the spout and pull it toward you. If it is still stuck to the wall, it may also have copper threads inside to hold it to the internal pipe. A firm twist may dislodge it, but be careful not to jerk it away from the wall and damage the internal pipe. Cut the thread and twist counterclockwise. Insert the end of the screwdriver into the spout opening for leverage and extra force to twist off, if needed, after cutting the thread. Caulk or mineral build-up may cause the spout to stick to the wall. Scraping the caulk directly connected to the base of the spout will help it become unstuck from the wall. If a gentle scrap does not do the trick, use a razor or a putty knife to get in between the wall and the spout. Use a flashlight to determine if there are any obstacles interfering with the twisting motion. Make sure that the knife or razor does not nick the internal pipe. Instead of threading, your spout may have an additional brass adapter inside that is connecting it to the pipe. Gently jiggle the spout to loosen it, then try twisting it off again. It should twist off the brass adapter as well as the pipe.